I’m not a McDonalds fan. Not even a little bit. But my kids are kids, and so we end up there from time to time. Today was one of those times. But I was pleasantly surprised. I tried one of their new smoothies and I was so glad I did. It was delicious! 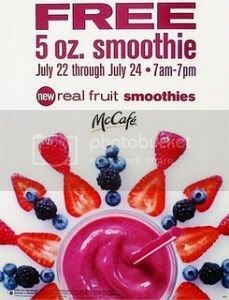 Then the cashier told me they would be giving them away for FREE from July 22nd – 24th, from 7am-7pm! You don’t even need a coupon. You can choose between Wild Berry or Strawberry Banana flavor. I tried the Wild Berry and it was so yummy! If you can’t wait until the 22nd, grab this $1/1 coupon and go buy yourself one! Any limit on the number you can get free at one time? Can I take all five of my kids in at once? They told me 1 per person, so that should work. But I would certainly call your locaton before you head out! I heard this was cancelled. Can anyone confirm?